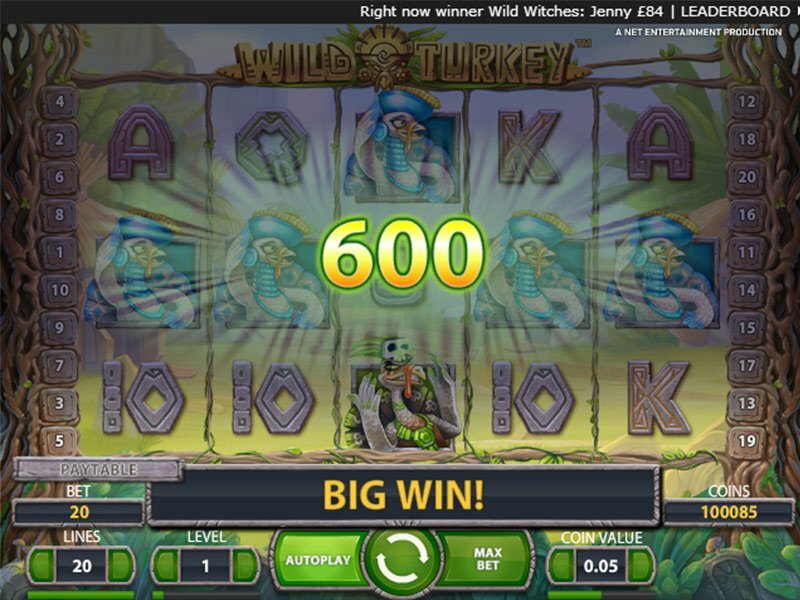 The Wild Turkey slot machine is a highly entertaining game, just what you need to enjoy the slots. Attention to artistic and graphical detail easily helps you create an entire world in your mind where you can imagine wild turkey society flourishing. Explore this new great nation and earn your share of the Wild Turkey treasure! Get the diplomats, scientists and financial aid ready! The wild turkeys have created their own civilization roughly based on that of the Aztecs and other South American Empires. You know what, put the army on full alert too. These wild turkeys have got spears and clubs embedded with sharp obsidian stones. 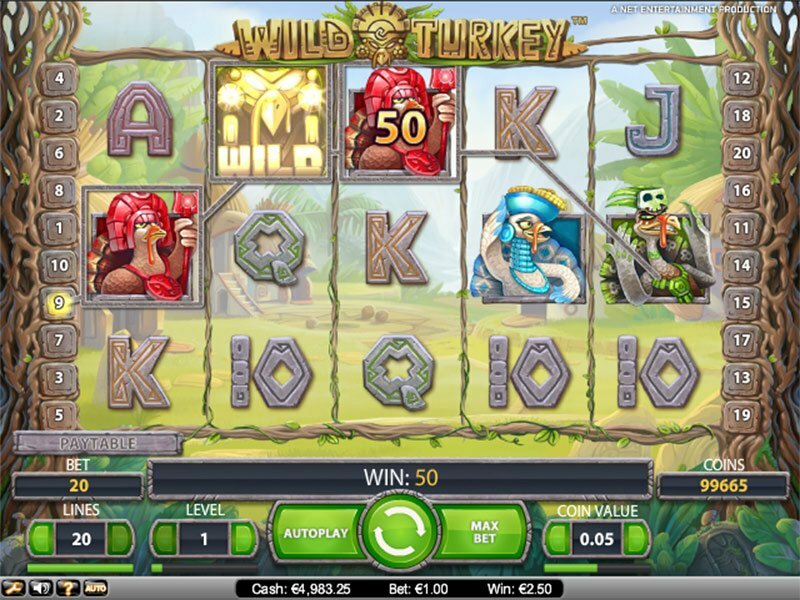 Built by the highly regarded software provider Net Entertainment, graphics at Wild Turkey slot are excellent. All of the visuals are animated drawings like most online slot machines, but somehow NetEnt always manages to capture a higher quality of animation. Perhaps it’s just their style, but the symbols and background drawings are clear, engaging, funny, and wildly imaginative. A good example is the Turkey huts that they animals have built for themselves behind the reels. Each hut has a doorway shaped like the beak of one of their kind. Audio at Wild Turkey slot is minimal, but highly appropriate. Soft tribal drums provide the background music which is neither too much nor too little. In fact it gently adds to the atmosphere while being hardly noticeable. Sound effects for wins and spins are much more dynamic while still being based on the tribal theme. Red is the color of royalty in the Wild Turkey nation and the king appears to be influenced greatly by the culture of ancient Egypt as well as the Americas. The wild turkey shaman is ready to make sacrifices dressed all in green, but just like in any other proud nation, it’s the warriors who form society’s backbone. The veteran soldiers have passed the war ceremony where it is tradition to pierce your beak with your enemy’s bone. They carry swords like those of the ancient Aztecs with obsidian blades while the new recruits look nervous but determined as they clutch their primitive spears. 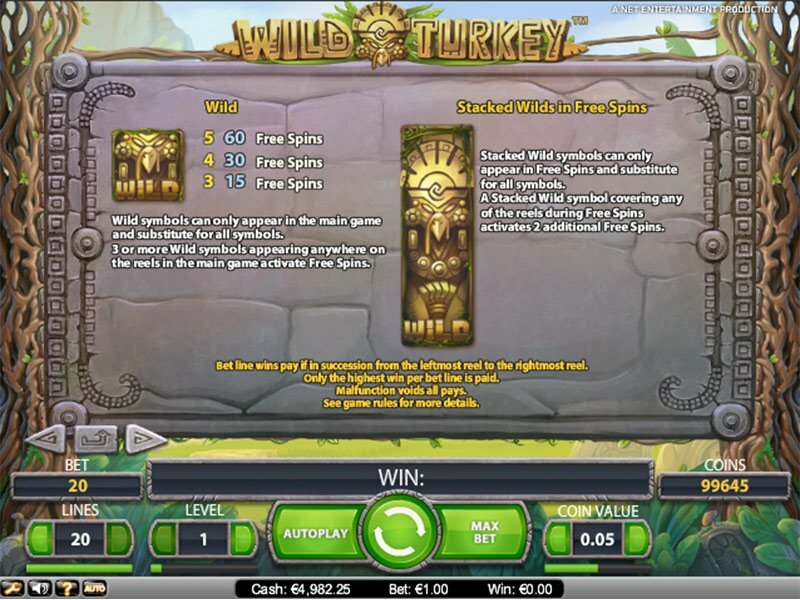 The wild symbol of a wild turkey statue will win you free spins and more spins can be won with the stacked wild symbol of an immense wild turkey pedestal that will give you two more free spins.